Have you ever seen dancing raisins? 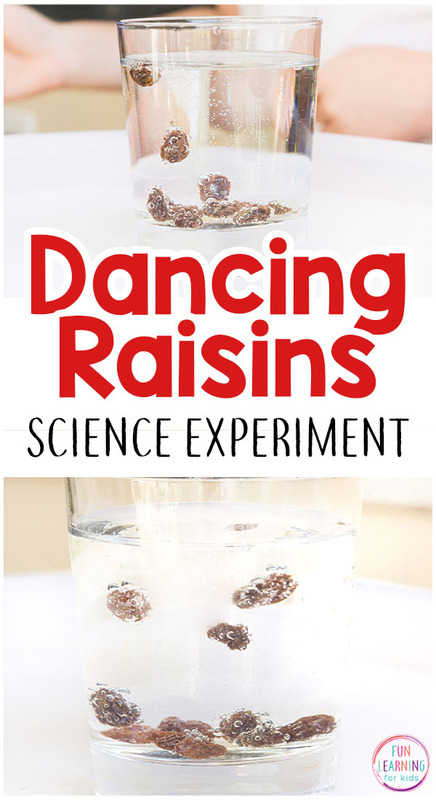 The kids will get a kick out of this super cool dancing raisins science experiment! It’s super simple to do too. 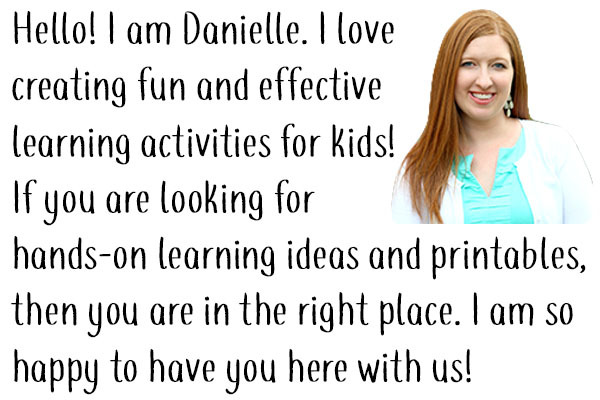 It even includes free printable recording sheets for preschool and elementary students. 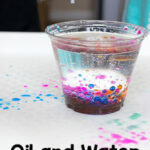 So grab a few household supplies and do this fun science activity! 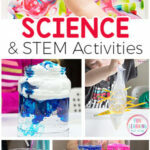 I am always so thrilled when we do a science activity and it’s super easy to set up and do with the kids. 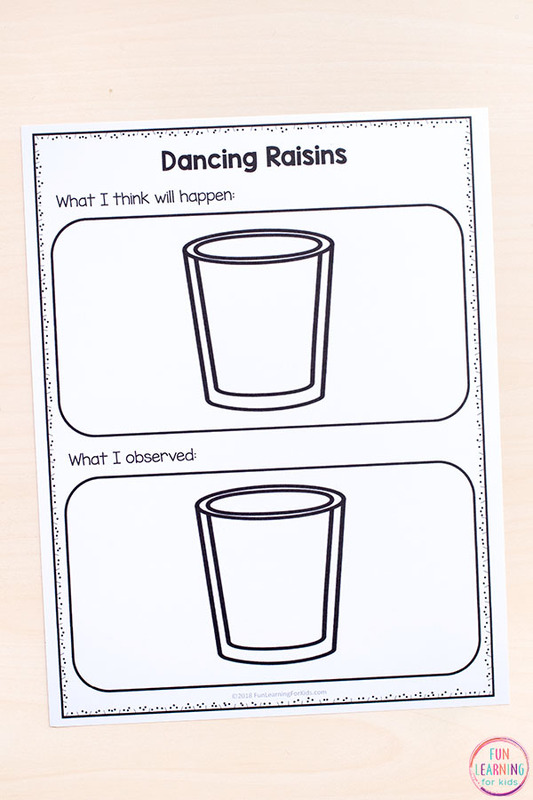 This dancing raisins science experiment fit the bill exactly! You only need two supplies and it actually works! 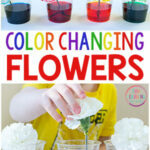 The kids get a kick out of it and they learn a lot too. 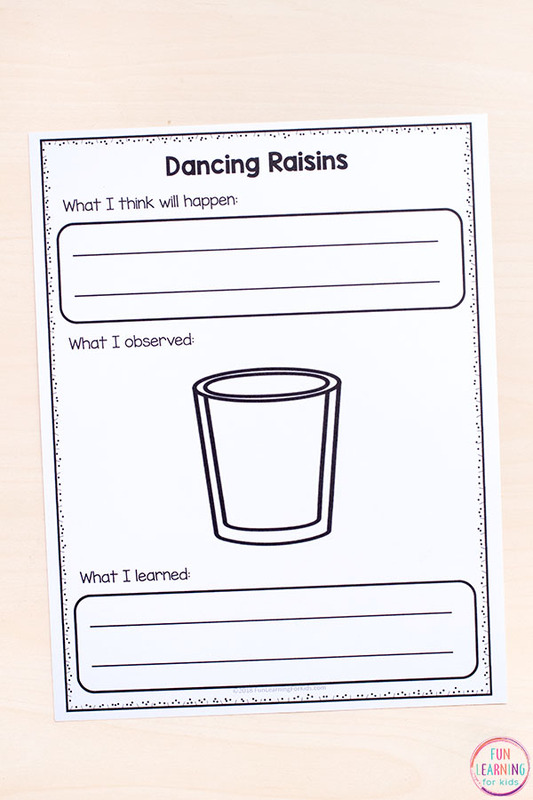 My kids had lots of questions about how the raisins danced and that opened the door for me to explain some of the science behind this experiment. Make sure you scroll all the way down to get the explanation of why this works and to grab the free recording sheets! *Tip: You will want to separate the raisins first. If they are stuck together they won’t dance. Small/medium raisins worked better as well. Fill a glass with soda. 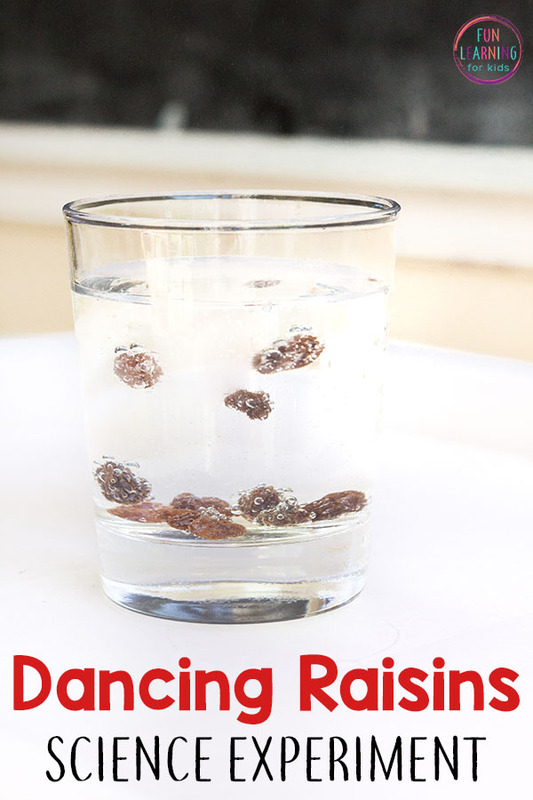 Drop raisins into the glass. What happens? Do they sink or float? Then sit and watch what happens. You may need to be patient. It can take a minute or two for them to start moving. The kids got a huge kick out of this! 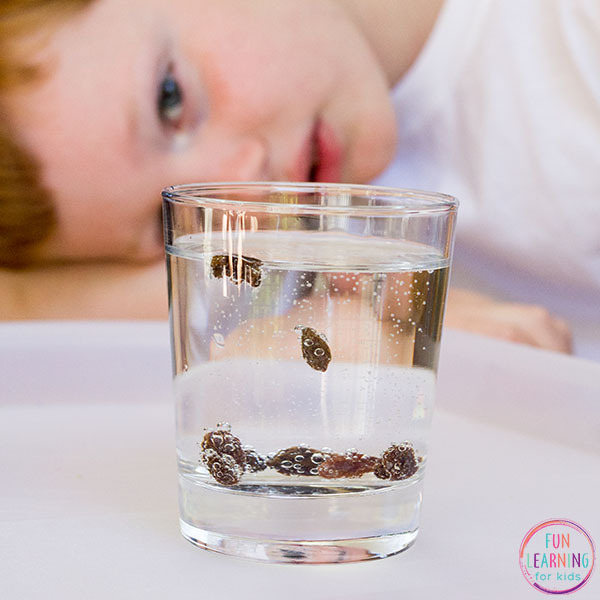 They loved watching the raisins get lifted up and then pushed back down in the soda. 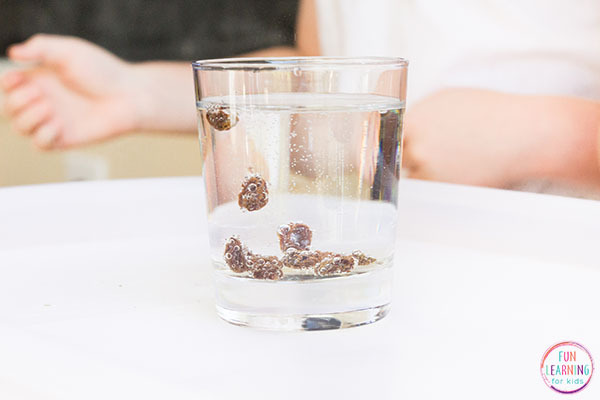 It was really cool to see the bubbles attach to the raisins and lift them up. 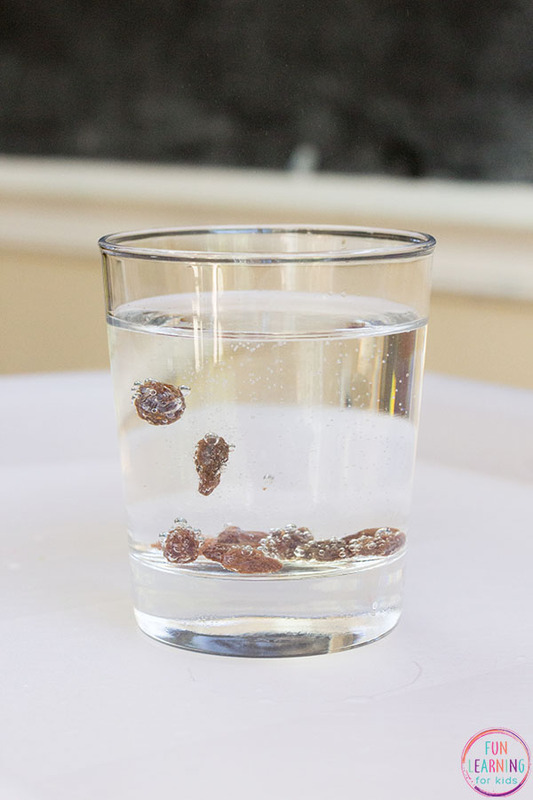 When you first drop the raisins in the soda they sink to the bottom of the glass because they are more dense than the soda. 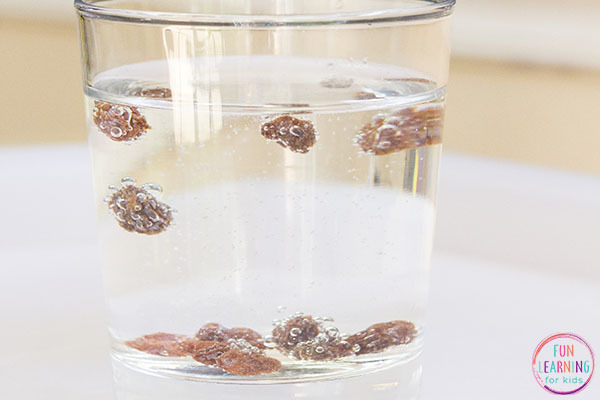 But the carbonated soda releases carbon dioxide bubbles and these bubbles love to attach to the rough surface of the raisins. They act like tiny floatation devices that lift the raisin to the surface of the water. This is due to an increase in buoyancy. 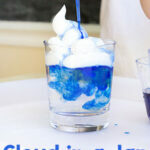 Once the carbon dioxide bubbles reach the surface of the soda they pop and the gas is released into the air. This makes the raisin lose buoyancy and fall back down to the bottom of the glass. This continues until all of the carbon dioxide has escaped and the soda is flat. Try different kinds of soda and see which one works best. Try adding different things to the soda. Some popular options are pieces of uncooked pasta, corn kernels, and lentils. I’ve heard rice works, but white rice didn’t work for us. Maybe try brown rice? 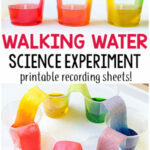 Print out the free printable recording sheets and have your kids record their predictions and observations. There are two kinds of sheets. One for preschool and kindergarten that requires only drawing and one for older students who can write a simple sentence or two. 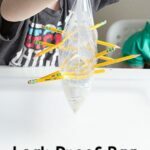 I hope you and the kids enjoy this fun science experiment!